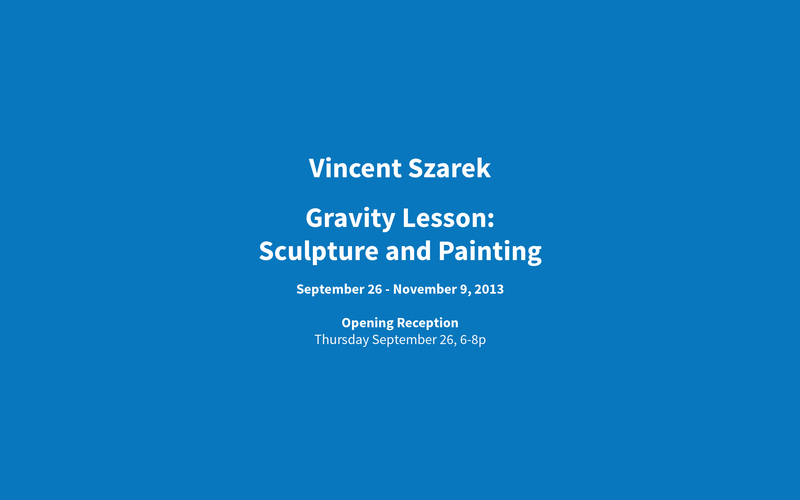 Artist Vincent Szarek was introduced to car culture when working in a body shop while growing up in Rhode Island. In this environment, Szarek learned to employ materials associated with fabricating custom cars and surfboards. His exposure and refinement of this industrial methodology continued while he studied painting at Rhode Island School of Design. The sculpture and painting included in Gravity Lesson at C. Nichols Project can be seen as the anvil and black hole from the Wile E. Coyote/Roadrunner cartoon... The Anvil is the threatening weight that lands on the coyote, The Black Hole as the fickle portal that lets some through, others not. ACME is realized with an elegance closer to a Mapplethorpe photograph than a cartoon. Vincent Szarek's work was most recently seen in Los Angeles during "Painting in Place" curated by Shamim M. Momin of Los Angeles Nomadic Division at the Farmers and Merchant's Bank. He has been in numerous international shows and a solo show at PS1 in Long Island City, NY (2003). Upcoming shows include solo shows at Ruzicska, Salzburg Austria in January 2014 and Gallery Clemens Gunzer, Zurich, Switzerland in April 2014.